Happy Kitchen Sink Monday, I hope you had a wonderful weekend! I've got a lot of things to share with you this week, so I'll be multitasking on quite a few posts, so I can fit it all in! Before I tell you what's new in the Kitchen, I wanted to share my KSS Monday post with you. As I mentioned, I'm multitasking today, so I used MJ's TechnoStamper Sketch challenge as the inspiration for my layout. For the background panel I used the Double Bugging Technique from the June TJNL, using the Swiss Dots and Distressed Striped Folders on Mellow Moss card stock. 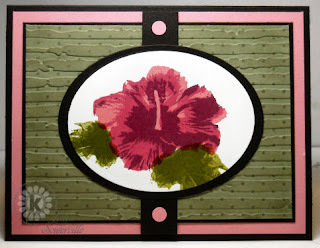 The image is from Kitchen Sink Stamps 3 Step Hibiscus. To create the flower, I stamped in Regal Rose, Melon Mambo and Rich Razzleberry. The 3 steps in the leaves were stamped in Old Olive (stamped off), Old Olive and Old Olive. Don't forget you can save 10% on all your purchases at Kitchen Sink Stamps when you use code LISA10KSS at checkout. Now to the exciting things going on at Kitchen Sink Stamps - it's Sneak Peek Time! Sneak Peek Time also means Giveaways from Maria at Kitchen Sink Stamps! Kitchen Sink Stamps will be releasing 7 NEW stamps sets on July 7th! Each day Maria will be posting peeks on her blog with a chance for you to win Kitchen Sink Stamps new releases. I'll also be posting some sneak peeks here on my blog, as well as the other KSS DT members - so be sure to check back. Your beautiful hibiscus looks stunning on this double embossed background!! What an exquisite card, Lisa!! Gorgeous Lisa ... I like the way you did your double bugging and the flower is so well painted!!! So beautiful, Lisa!! Love the hibiscus in these colors...very rich! Awesome card Lisa, and awesome colors!!!! Got to give the "Double Bugging" technique a try... fabulous texture with depth! The 1/4' circle punch makes a wonderful faux snap/brad! Thanks for all the inspiration! Just stunning, Lisa!! You always have excellent color choices!! Love the embossed background, too!! Goooooooorgeous!! Such beautiful colors too! You have been one busy woman! I love the way you showcased the hibiscus and added some extra texture. Holy Smokes is this a cute card!?!? Wow! Beautiful, Lisa! I really like the rich layered colors in the flower.